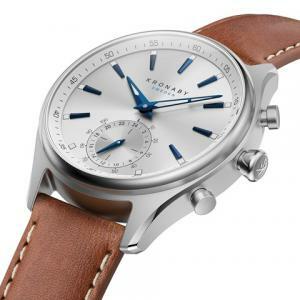 In-Depth: Swedish Hybrid Watch Brand Kronaby to Launch Payments Wearables with Innovative Provisioning System | NFC Times – Near Field Communication and all contactless technology. Hybrid smartwatch brand Kronaby plans to enable provisioning of payments after the sale using semi-active secure elements and Bluetooth technology. Working with chipmaker STMicroelectronics and provisioning company Fidesmo, Kronaby’s hybrid watches could potentially enable consumers to load their preferred credit and debit cards from their smartphone wallets to their watches, just as they do with the mostly high-end smartwatches supporting Apple Pay, Fitbit Pay and Garmin Pay. That is uncommon for hybrid smartwatches or fully passive analog watches, especially using Bluetooth. Almost all passive EMV-compliant chips are personalized in a secure data center. It’s possible to provision passive wearables outside of a data center—even after the sale of the watch or other wearable to consumers. But it requires NFC reader/writers to write to the passive chip, which can create some logistical problems and is not as easy as enabling users to transfer card credentials from their smartphones to their watches via Bluetooth. Article has about 2410 words.